Before we begin, I want to call your attention to this informal poll I am taking. I've already received some wonderful answers and so far, all but one person has left a response, whether they use stamps or not. Please take a minute to read the post and leave a comment. I bet you are tired of me showing the gifts I received, but I simply can't help it. It's the only way I know how to show my gratitude. Both Bleubeard and I received this first gift. I'm already loving it, and haven't even opened it. Look at that deeply etched bubble wrap on which I can slap paint and inks. This is a wonderful "thank you" gift from Sandra Cox. Although she doesn't participate in T Tuesday, she always shows up and leaves a lovely comment. I enlisted my friend RO's help in getting Sandra's address after I read all the death that she endured around this past Christmas. I told RO I was going to send her a card, but my cards are rubbish. Yes, rubbish. However, I can make quiltlets, or little art pieces made from fabric and paper that can be hung on walls, etc. I made one for Sandra and this is her showing her gratitude. I promised her I would share it with Bleubeard, but I'm not sure he'll "get" it! Thank you from the bottom of my heart, dear Sandra. 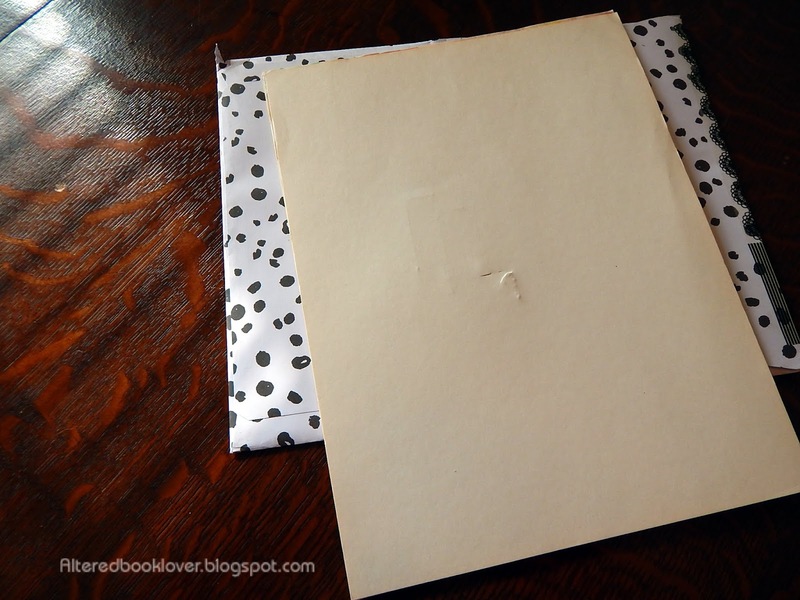 I can't wait to turn the pages on this mystery/fantasy. Everyone can read the first three chapters here. The next gift came from my very dear artist friend. I suspect she colored that envelope. I plan to use bits and pieces of it in my art, too. Isn't this gorgeous? As an aside, look at those postage stamps. I can't help but scratch the Popsicles every time I walk by because that stamp smells so good! By now you have probably read this is from Dianne. Dianne and I were in a six person swap a year or so ago, and my theme was rust. This is a page I can add to that book. She even punched the holes for me, so once I photographed it, it was ready to go with my other wonderful pieces she made me. The teapot is my T Tuesday entry today. I couldn't have asked for anything better. Even the quote is perfect, especially since Dianne LOVES quotes. 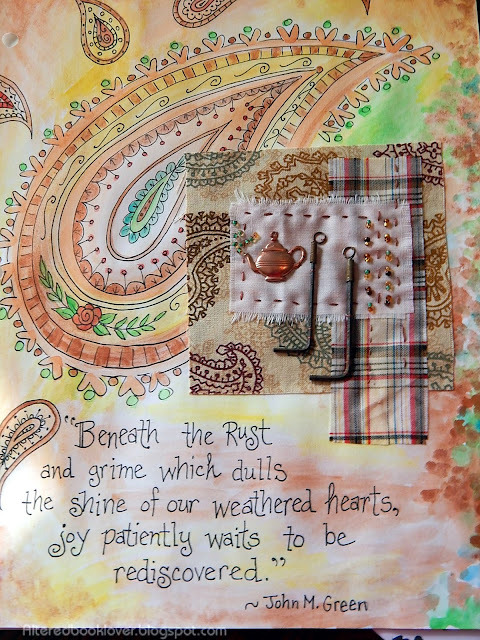 One more look at this gorgeous hand painted, handmade, hand sewn, and rusted journal page I can call mine. Thank you beyond belief, Dianne. It's now time to share your own drink related post. It can be photos, a place you visited, movies, postcards, books, sketches, mixed media, drawings, paintings, tags, scrapbooking, or other art that is digital, hybrid, or traditional, as long as it in some way relates back to a drink, any drink. Regardless, please share below and Bleubeard and I, along with the rest of the T gang will be by to visit. Please link only your T post and not your blog in general. Old photos are acceptable because they may be taken any time, not just on Tuesday and not just this year. EDIT: My sincere apologies for not visiting sooner, but my electricity went out about 4ish this morning. It is finally back on and I will be by to catch up with each of you soon. Lovely gifts Elizabeth, it looks a thoughtfully chosen book from Sandra and a beautiful art journal piece from Dianne. The little tea pot looks amazing and the quote is really lovely. I will stop by and read the answers you got in your poll. Happy T Day Elizabeth, have I missed a Birthday..?? I've been offline for a week or more, down with a bug so I've missed quite a lot. I will take a look at the link when I've caught up on a few things and come back to it. Lovely received gifts so thoughtful. 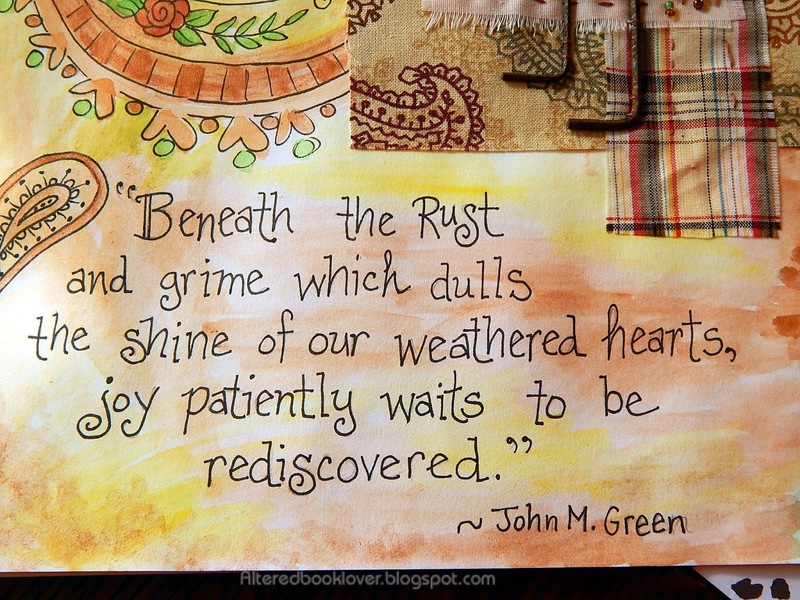 LOVE the rust page by Dianne!! She does such beautiful work. 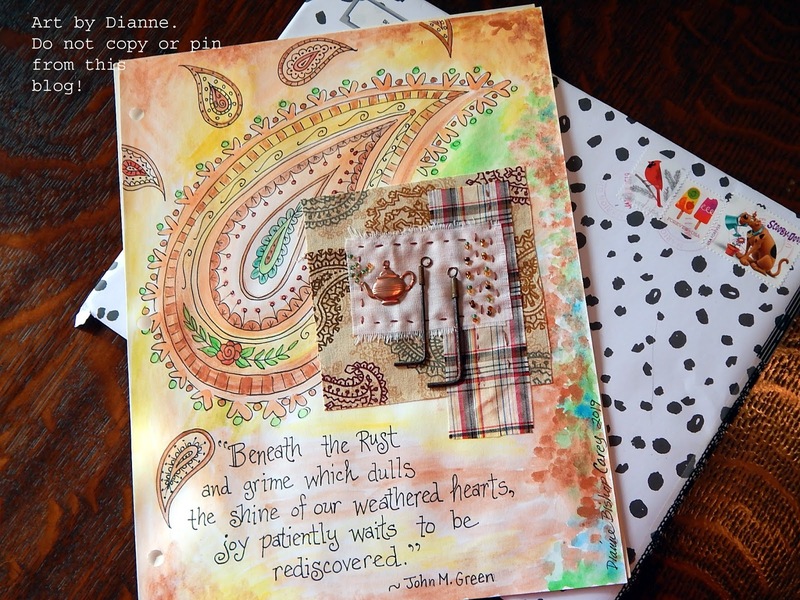 Dianne's art is gorgeous! Love the little teapot, and perfect for T Day! I understand you want to shwo off your gifts. People have been so generous and kind. I would do the same. 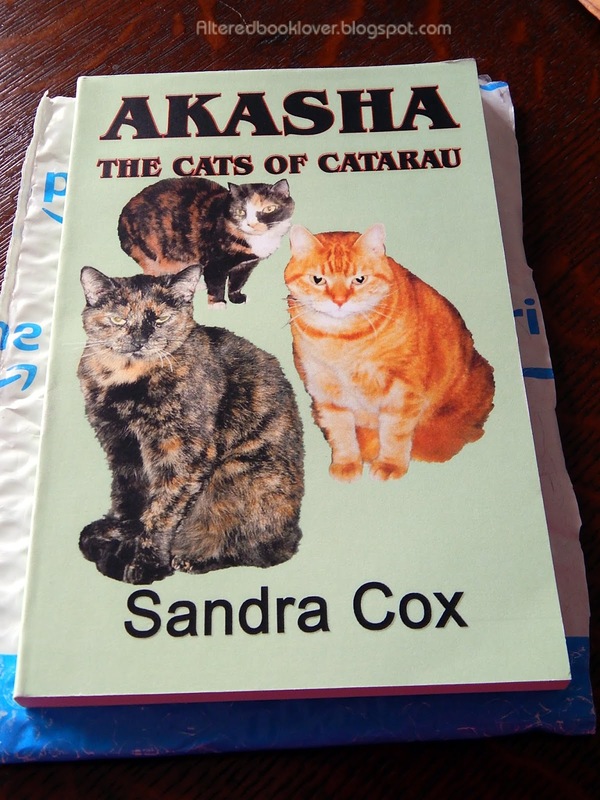 Sandra's book soundss intriguing. Cat heaven? I'm ure you will read it to Bluebeard and Squiggles before bed time. 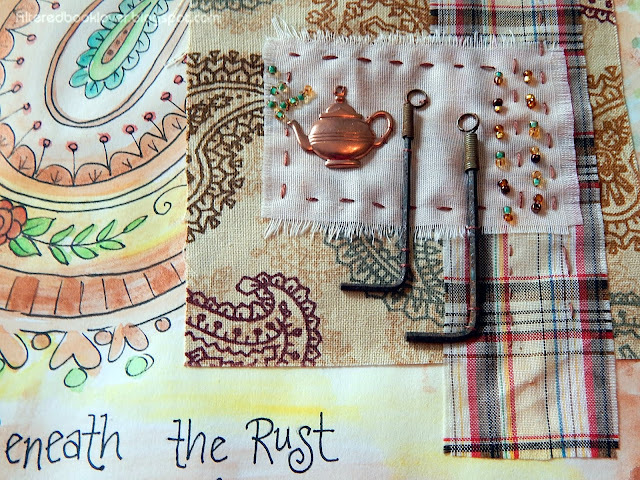 The rusty paisley card is beautiful. Of course the little tea pot is perfect for today. I quite like the quote too. I'd never heard that one. I've been saying it out loud because it sounds so good. The envelope is beautiful and of course the stamps are very special. I've just read the Martin Luther King Day post and about the poll. I will answer you question in the morning. It is now half past midnight here and I am going to bed. These are amazing! These are distinct works of art. Lovely indeed! Sandra's book -- that's special and Dianne's work is just lovely! I hope Bleubeard enjoys the book as much as I know you will, Elizabeth. Dianne created a wonderful addition for your rust book - lucky you. I love Dianne's illustrations. She added some unique embellishments to this that make it even more special. Who wouldn't want to show off such wonderful gifts! I took your poll this morning....and added a lot of talk about mostly nothing LOL! 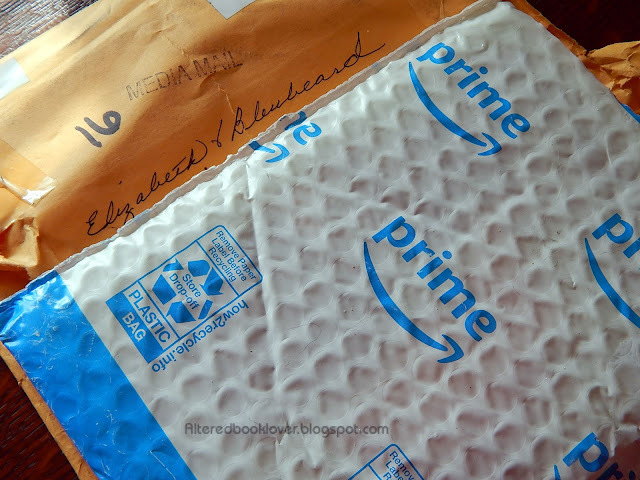 Lovely gifts here and this is a lovely post ..
You and Bleubeard were just lucky to receive such amazing gifts! Wonderful! Have a very happy T-Day ! You are such a fantastic host each week! You must enjoy going to the mailbox, you get some wonderful stuff. As a long time reader of this blog I know how caring you are. You deserve every bit of the goodness that comes your way. I just left my response for your poll. Your gifts are lovely and I always enjoy that you share them. There are so many different styles out there and I love seeing them. I saw one of the quilets that you sent to someone and it was stunning! You certainly have a talent for making those. Not everyone enjoys stamping and I admit that I struggle at times to get a clear image. It requires a lot of practice and the right ink. Thank you for sharing the beautiful gifts you've received with us. It's wonderful to see the goodwill and generosity of this crafty world we all share. Oh, so glad you are pleased with the piece dear E! but did I spot a tear in the cardboard enclosure? hope the actual piece is undamaged... the envelope was not very heavy, as I pieced it together from that spotted paper - it's scrapbook paper, I didn't actually put the spots on there! ;) yes, I remembered your Rust book, so thought maybe it could use another page. I loved those scratch and sniff stamps too! they made me smile...and then last time I was in the P.O. they said they had Scooby Doo. I SHOULD have asked if they have anything with cats! My schedule won't permit me to participate in the T party hop today, but I did manage to put up a new post on my blog. happy T day dear friend! stay warm! Great gifts, Elizabeth. I love cats and this book is perfect. As for Diane's art, I simply love her project. Hugs, my dear friend. OOh, I love Diane's card. It's gorgeous. Nice gifts again♥♥♥ I'm not much of a stamper at all so I wouldn't have a clue if it's losing it's popularity. Such lovely gifts from Sandra and Dianne, I'll be visiting both blogs too. 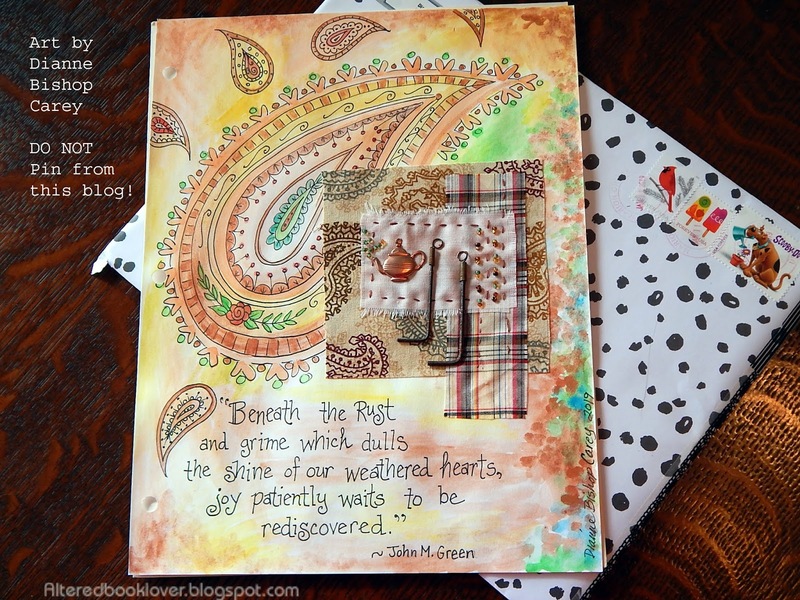 That decorated envelope, stamps and decorated card are beautiful. Especially if you're an adult and must get gifts for a younger person and don't sit and watch the television channels that possess the latest toy commercials. For more information on gifts ideas check here.